If it isn't too hot, families should enjoy picnics! 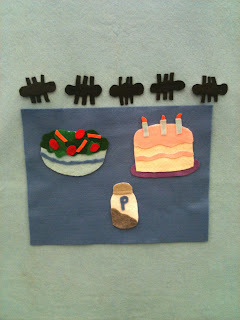 This is the storytime that I did during the week of July 4th, and hoped that some families were going to do the tradition of joining the outdoor festivities, which includes yummy food noshing, before the firework show. The children loved the theme, and all of theme loved the reading of The Very Hungry Caterpillar. The preschool children loved sneezing during the Five Hungry Ants rhyme. A word to the wise, be prepared for a response about what happens to the ant(s) after they sneeze. A boy who kept on saying that they died when they sneezed! I said they were so tired after sneezing really big that they had to take a break. Whew! The toddlers liked seeing the animals, especially the sheep because they were zooming fast to catch up. One little boy thought it was because they wanted to eat the mice. Thankfully he agreed when I said that they were probably wanting to go on the picnic with the rest of the farm animals too. Eating yummy food is always a good idea for a picnic. Even the Preschool children wanted to read this story instead of another "picnic" book. A book about friendship and being prepared. The children loved guessing what would live in a cave. We're Going on a Picnic (T, P) - I ran out of time before I got to do this one. We did our usual shaking in the Toddler Storytime, but because I was running out of time and wasn't able to do our last song, I had the Preschoolers do some egg shaking as well. They loved it! In both programs I added in the song "Head and Shoulders," which they got the grasp of all the while shaking an egg. This is a flannel board. 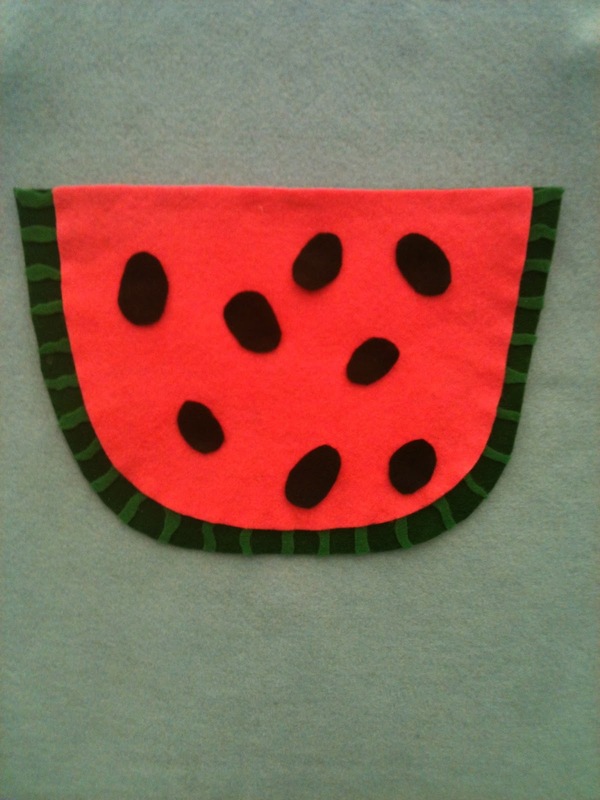 No rhyme (at least not until I write one up, eventually), just sticking seeds on the felt watermelon. To make the watermelon just made fat U-shapes from the pink and green felt. I added in light green felt squiggles to give the skin some variety. The seeds are just regular black felt ovals. They were the perfect size for a toddler's hand. To go along with the rhyme, I flannelized the elements. How awesome is that salad? The children thought that my pepper shaker was a sock, but I'm that it was because they never really paid attention a salt and pepper shaker in real life before. The ants were three lumps with three strips glued on the middle of the backside. The children loved making the sneezing portion of the rhyme. One boy kept on saying that the ants died every time they sneezed. I told him that each ant was just tired from such a big sneeze! To keep it simple this time, I cut out pictures of food from magazines and had the children glue the pictures to a paper plate. They could color their plate with the crayons if they wanted too. I need to get a better camera or try to take pictures in a different room. I'm getting dark pictures right now, it's depressing despite the uber cuteness of the flannel boards! Summer is a great time to go camping with the family and explore the world of nature on a hike. Granted, if you are in Texas right now, it may be a little (a smidge...) too hot to actually do it. So! 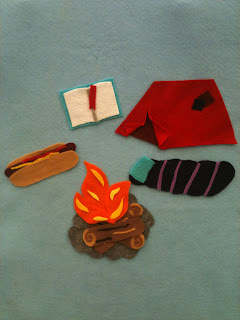 I brought camping and hiking to the library's storytime! The children thought it was a fun program, and some told me that they went camping too. We all loved our discussion about s'mores! This was a great book for the toddler program. All the animals in the story where ones that you might come across when you're hiking through nature. One little boy loved seeing all the animals and would help me name all of them. This was a little long for toddlers, so I skipped over some of the elements that we had to go through. This was a fun book to read. The children thought it was funny that alligators were scared of their own shadow. Of all of the books, this was one of the most popular with the preschool children. They kept on shouting that there was no more room in the canoe whenever the next animal appeared, asking if they could come aboard. The children did a great job with keeping tack of the number of fireflies in the jar and outside the jar! 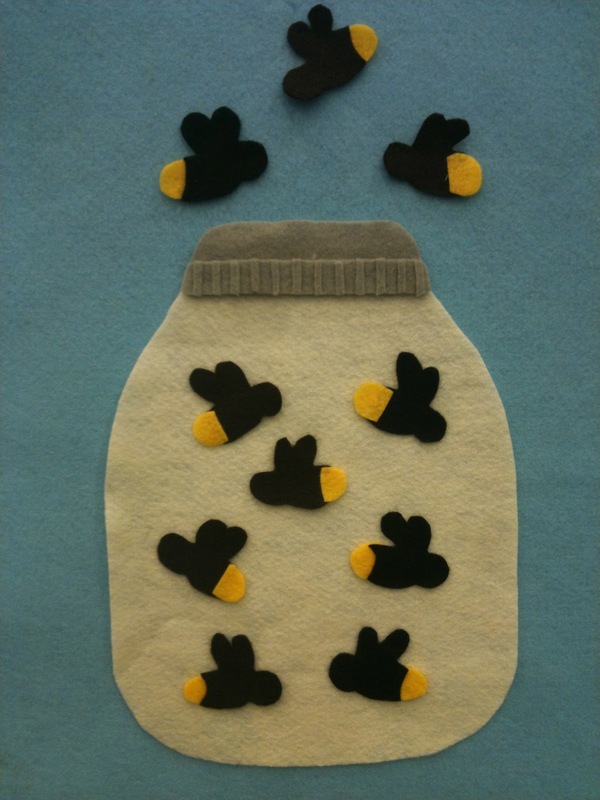 To go along with the rhyme I created a felt jar and a bunch of fireflies. In the picture below you'll see that I have more than five fireflies. This is because I had about ten toddlers in the program and I let them all put a firefly in the jar. To create a visual for the song, I made a tent, camp fire, a hot dog, a book, and a sleeping bag. The children kept on telling me that the sleeping bag was too close to the fire. You can't get enough egg shaking! 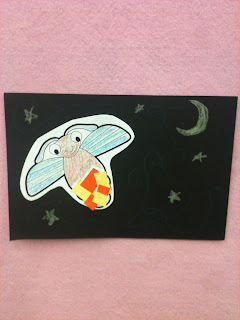 The toddlers had to glue a picture of a cartoon firefly onto a sheet of black construction paper then paste little bits of yellow and orange paper to its bottom, which helped create the look that he was glowing. The really fun part, in my opinion, was everyone using the special construction paper crayons. They crayons are AMAZING! 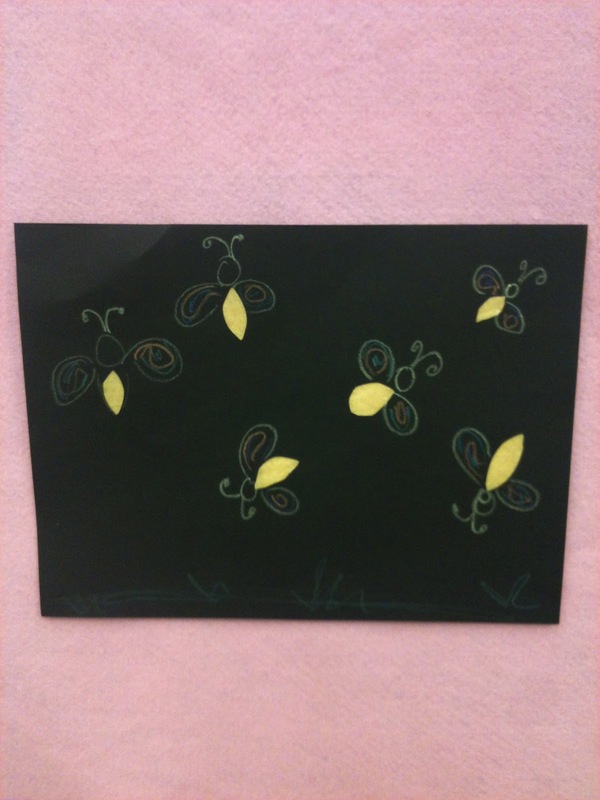 You can color on black paper and you can see the crayon marks! All our pictures looked like the night sky! 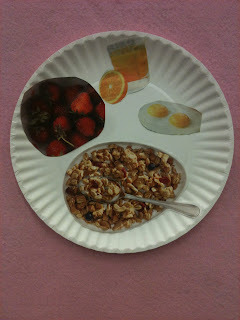 I saw this craft idea online at Inner Child Fun and loved it immediately. I took more construction paper and pre-cut six oval shapes. The preschool children had to glue little squares of yellow tissue paper on the backside of all the holes. Then they used the amazing construction paper crayons to create the bug's body and the rest of the night sky. 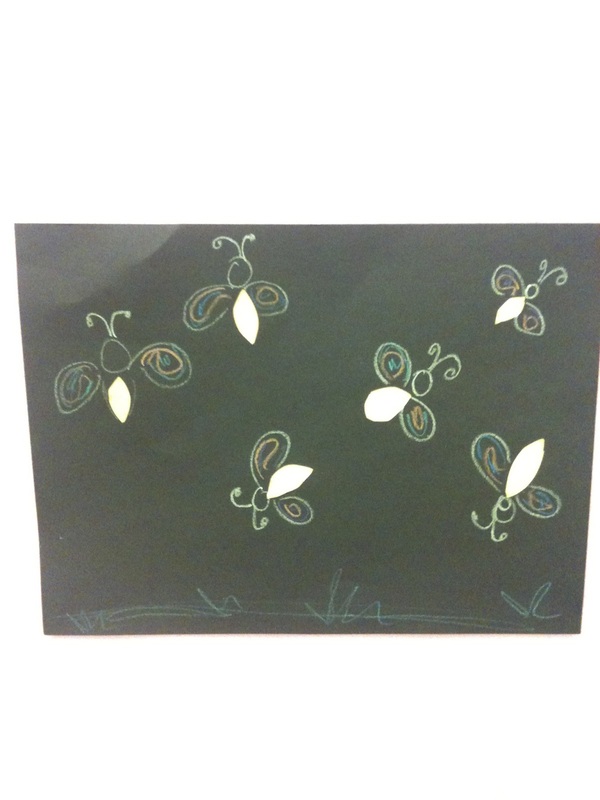 If you hold your finished work of art up to a light or window, it looks like the fireflies are glowing! The children left the program dancing around the program room with pictures held up to the ceiling were all our lights were. Toddler Storytime, Created by Dorothy WP-CC, 2012.